We build many lean-tos in a year’s time however most of them are an addition to an existing structure such as a barn or storage facility. This open lean-to was a stand alone building we built in Poulsbo Washington. Measuring 14’ x 20’ x 8’, the roof line was 11’ at the high end and sloped down to 8’8” on the low end. Although all the bays were open, we designed a metal eave skirting matching the enclosed gable height that circled the perimeter of the building. 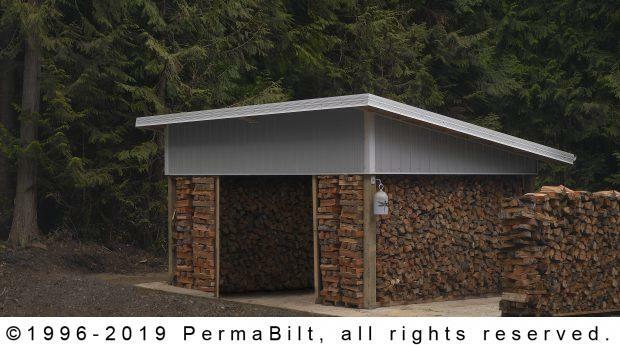 The roof system included 2” fiberglass vapor barrier metal building insulation, standard in all PermaBilt’s buildings. The customer was having a larger building built at the same time and decided to get all his building done at once. Accessories included full perimeter 18” eave and gable overhangs. These overhangs are nearly a necessity in our Northwest climate as they keep rainwater away from where the roof and wall meet. 20’ Of 5” K-Line gutter and a 10’ downspout were also added as well as a 24” splash block.